Two years ago I bet economist Harry Dent an ounce of gold that the price wouldn’t fall to his prediction of $750/ounce. He had made some noise in the gold community that year about how gold was going to crater. He advised selling your gold and buying dollars. He even stated that $750 wasn’t the stopping point, that the price would fall to as low as $250. I couldn’t pass it up. I wrote an open letter to him, citing why I thought he was wrong, and offered to bet him a one-ounce gold Eagle. I even raised the target to $800 and gave his prediction two full years to come to fruition. He accepted. My bet was a bold one at the time… if you remember early 2015, the gold price had been falling for two years, and showed little sign of stabilizing. Almost no one thought the bottom was in. Market participants had been decimated. Gold showed some life in January that year, but by the time we finalized our agreement in March the price had fallen another 12%. It dropped below $1,100 that summer, and by December hit $1,049. My wager was not looking so good. But gold never fell to $800—never even cracked three figures. I won. And yes, he paid up. (He kept his word and sent me a check for the proceeds, including a little extra for a purchase premium; you may not agree with his predictions, but this speaks highly of his character). So why did I win? That was a softball pitch. The largest source of demand for gold is clearly as money, not as a commodity. This has been the case for literally thousands of years. Jewelry is the second-biggest use of gold, but even much of that is disguised as monetary demand, too. In Asia, for example, where the size of the jewelry market is much bigger than North America, gold jewelry is bought not as just an adornment but as a store of value. We buy gold Eagles and store them; they buy gold necklaces and wear them. Several Indian women I’ve interviewed told me they view their gold necklaces are “collateral,” an investment they can sell as a last resort. They’re much more than just pretty necklaces. The smallest use of gold is industrial demand. Commodities are most often used as inputs in the production of other goods or services—gold serves this purpose but only on a small scale. 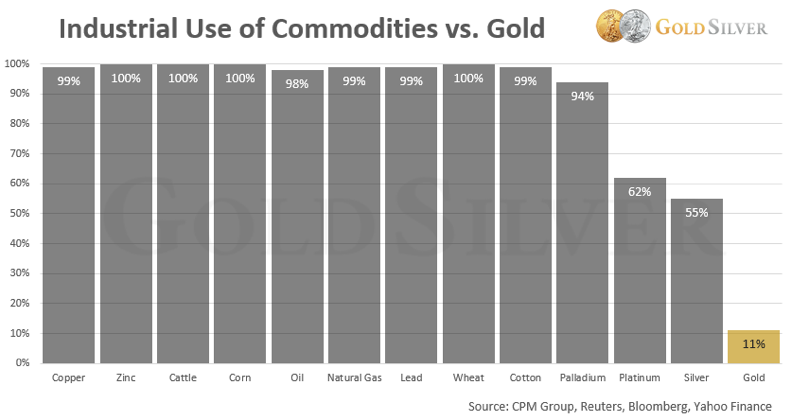 Here’s the industrial use of some of the most common commodities, compared to the industrial use of gold. Is gold really a commodity when only 11% of it is used as an industrial input? Hardly. History clearly shows that gold has been used, first and foremost, as money. At the time I sensed this was the crux of our disagreement. If I viewed gold as a commodity, I’d own less. If he viewed gold as money, he’d own more. So, since he saw gold primarily as a commodity, its price would suffer in a debt or deflationary crisis, which makes sense. But if we did get a crisis, I believed that gold’s role as a safe haven would draw investors to it and push its price higher (or at least keep its price from crashing). What is gold to you? How you view it will dictate how much you think you need to own. In a true deflation, all prices fall dramatically, including gold. But if banks begin to fail again, or we enter another recession, or geopolitical conflicts escalate, or [insert your reason here], many investors would see gold as the safe haven it is. In other words, the consequences from a deflationary event could serve as the very catalysts that push people to buy gold. Let’s be honest; gold is largely known as the fear metal. If fear and worry grows about the economy, markets, currencies, or geopolitics, gold is likely to be pursued and its price rise in response. • After Roosevelt nationalized gold, he raised the price to $35 just nine months later. In other words, the US government—during one of history’s worst deflations—raised the gold price 69%! • The only gold citizens were permitted to hold during the Depression were gold stocks. And they were runaway winners, doubling and tripling in price. They did sell off with the stock market in 1929, but Homestake Mining, the largest gold miner in the US at the time, rose 474% by 1933. And Dome Mines, Canada’s biggest producer, soared a whopping 558%! Junior gold stocks rose even more. This all occurred while the US economy suffered with soup lines, soaring unemployment, and crashing markets. Gold served as the ultimate safe haven at the time. 2008/2009 Financial Crisis: Gold fell in 2008 largely because investors needed liquidity. It wasn’t that gold was no longer a safe haven; it’s that for a short period of time the need for liquidity skyrocketed, and gold holdings were available. Recall that in spite of the massive selloff in October that year, gold ended the year 5.5% higher. And by the end of 2009, it was up another 24%. This while stock markets continued to flounder and unemployment soared. Virtually no other investment class logged gains during this period. • The point is that the effects of deflation can push investors into gold. During a period of extreme crisis, gold is sought as a refuge. This has been bore out repeatedly throughout history. Gold can be one of the most valuable assets to own when other investments are in decline. Although deflation has been muted over the past two years, this is another reason I won the bet. It’s why you and I should continue to accumulate gold today. Mr. Dent also made the argument that gold has no currency value. He challenged me to take a gold coin to a grocery store and try to buy something with it. Since gold doesn’t circulate throughout the economy, he believed this was one reason its price would crash. I took the bet because he confused money with currency. Contrast that with the dollar, or currency or your country… those are just pieces of paper with ink printed on them, with no fundamental value. Currency survives entirely on confidence, and that confidence erodes as debt climbs higher and if when central banks have to print again. The growth trajectory of our debt is unsustainable, just one of many crises gold can flourish under. Most investors reading this understand these reasons. But it’s a good reminder of why you shouldn’t bet on gold falling, but rather on it retaining and even growing its purchasing power in whatever crises get thrown our way over the next few years. Where will the gold price be two years from now? That depends on a lot of factors, but I’m personally betting not so much on the price but that I’ll be darn sure glad I own lots of it. By the way, here’s what I bought with the money Harry Dent sent me. I hope you’re joining us and preserving your financial future by buying physical gold.